The last year we’ve spent working with the team at Alpenglow, the ski chalet holiday specialist company based near us in West London has been a revelation. To go from a standing start eighteen months ago to a fully-fledged successful and expanding brand has been nothing short of inspiring. 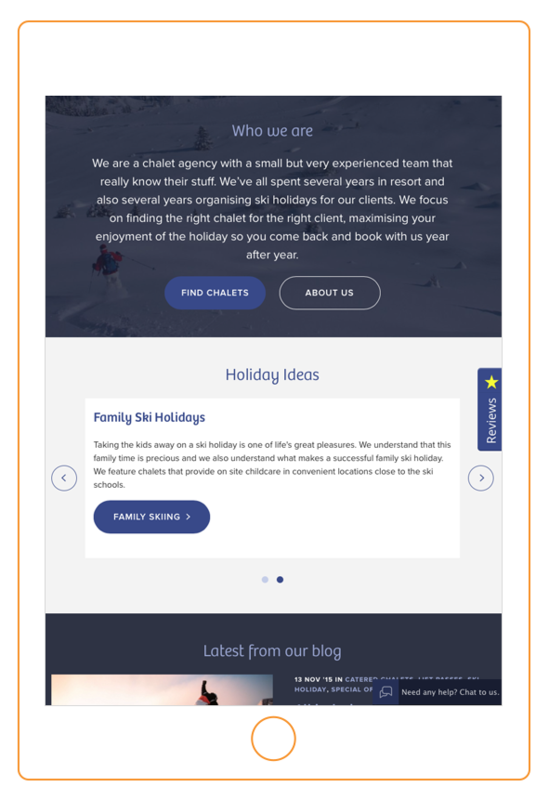 Our work with Matt, Emma and their team started with a completely new identity and then moved to a project which we believe really stands out among web design for ski holiday companies. In particular the key element of the project which has really stood out has been the evolving nature of the website. We’ve long believed that a website has to constantly move forward to be truly effective. Technology and sales techniques change so quickly, of course, so that’s one key influencer, but Alpenglow have done something far more interesting and allowed their website design to respond to feedback from their users. 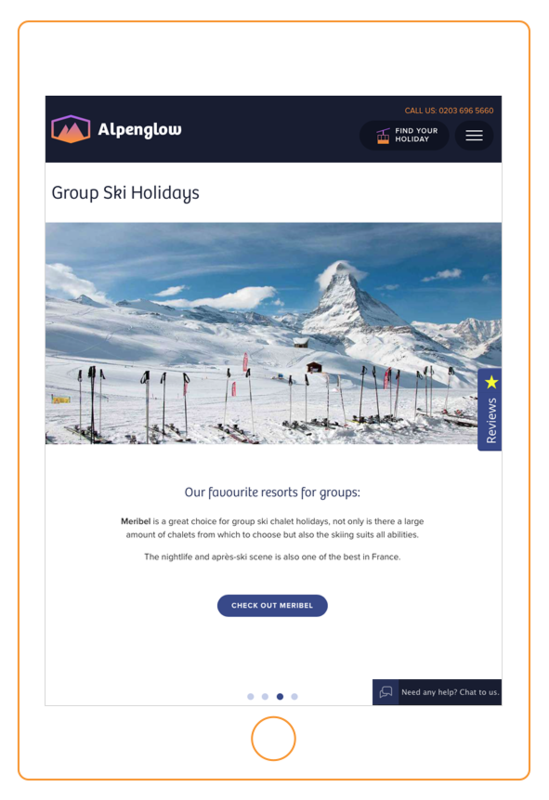 It’s exciting to see a project unfold in this way and over the Autumn we’ve completed a third series of design updates and new page designs for Alpenglow and the results are on their website now. 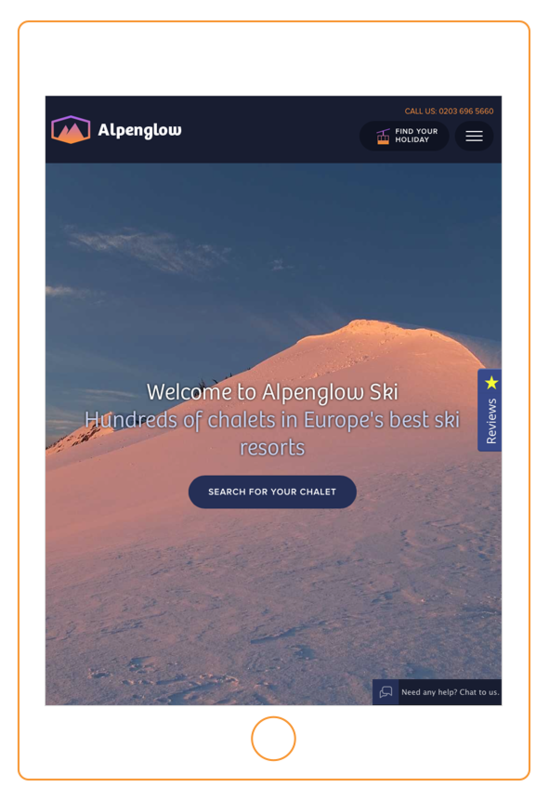 The first port of call for users, the Alpenglow homepage has always been a large, clean photograph which stands in sharp contrast to the busy offerings of their competition. We’ve tried many permutations of this page, but this simple layout (unusual in this industry) seems to resonate with their customers. While we have given a great deal of thought to the design of the page beyond (below) this panel, research suggests most visitors make their choice to enter a website at this point shown below, so we’ve given Alpenglow visitors straightforward choices to search the website or contact the company direct (the two primary ways in which customers interact with the site). Further down the page it’s a slightly different story as the business explains their offering to customers and offers a series of choices for different kinds of holidays and different kinds of holiday-maker. It’s this part of the page that we’ve gradually been changing and updating over the past year as the website grows larger and has both more chalets but also devises ways to reach different niche customer groups such as families, larger groups or romantic breaks. It’s our experience that customers choosing holidays, particularly in destinations which which they are not familiar, take their time looking into the resort itself and the benefits of being there whether it be the level of skiing on offer, restaurants or the kind of nightlife to expect. In turn, the chalet becomes part and parcel of an ongoing decision to commit to the holiday. So focussing on experienced, conversational pages explaining what to expect from resort as well as chalet has been key to the success of Alpenglow. In terms of web design for ski holiday companies, a simpler approach is astonishingly rare, as pages tend to be crammed full of information with precious few opportunities for the content of the page to actually breathe. We’ve always believed in that sort of layout as it seems logical and more persuasive to let a customer browse a site in their own time rather than constantly being overwhelmed with offers or special features. COULD THIS SORT OF APPROACH BE RIGHT FOR YOUR BUSINESS? If this sort of design and approach to content be right for your business, we would be really interested in helping you out.